Train travel in Sri Lanka . . . The mid-morning train from Colombo, in Tea Country. 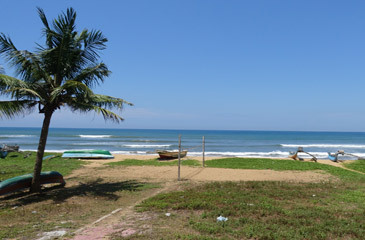 Sri Lanka is a fabulous place - safe, friendly and remarkably hassle-free. 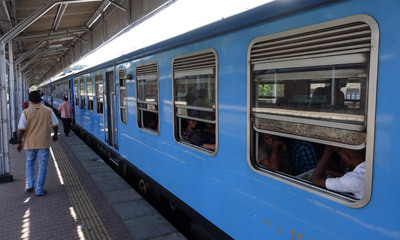 Taking the train is a great & inexpensive way to get around, the train journeys are real cultural experiences and the most scenic routes will be highlights of your visit - in particular the wonderful journey from Colombo to Kandy and up into Tea Country and the coastal train ride from Colombo to Dutch colonial Galle. British visitors will find the stations, signal boxes and old red semaphore signals very familiar! On this page you'll find a beginner's guide to taking the train around Sri Lanka. 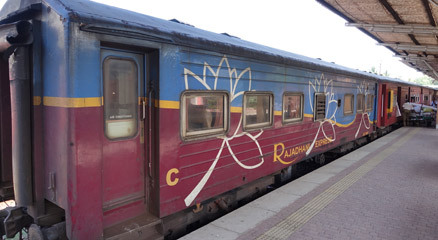 What are Sri Lankan trains like? GMT + 5½ all year. UK and most other western nationalities require a visa to visit Sri Lanka. The easiest option is to get an e-visa online at www.eta.gov.lk. Alternatively, UK residents can get a visa from the Sri Lanka High Commission in London, www.srilankahighcommission.co.uk. You can check train times between any two stations at www.railway.gov.lk, the official Sri Lanka Railways website. Click English, then click the pink Train schedule button and use the journey planner. You can also check train times & prices between specific stations using the journey planner at http://slr.malindaprasad.com. This site is mobile friendly, so you can add it to your smartphone's home screen and take it with you to Sri Lanka. These sites only handle direct trains, so don't expect them to tell you how to get from (say) Kandy to Galle except on the once a day direct train. And they may only show trains as having 2nd & 3rd class even if they also have 1st - although relatively few trains offer 1st class. And the two sites sometimes disagree, so always double-check times locally. Sri Lanka Railways 2nd & 3rd class unreserved cars cannot be booked in advance. 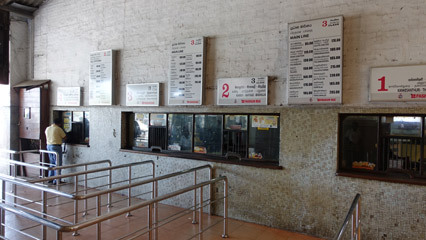 Tickets are only sold on the day at the ticket office, sometimes from only an hour before departure. Turn up, buy a ticket and hop on, it's easy. Tickets cannot sell out. - Counter 1 for Anuradhapura, Vavuniya, Talaimannar & Jaffna. - Counters 2 or 8 for Kandy, Hatton, Nanuoya, Haputale, Elle, Badulla. - Counter 3 for Batticaloa or Trincomalee. - Counter 4 for any station, 1st & 2nd class tickets only. - Counters 13 or 14 for Galle & Matara. 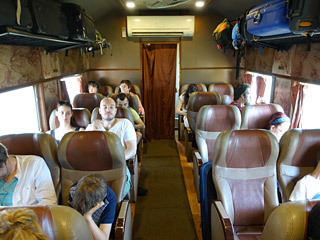 On the Colombo-Galle-Matara route, virtually all seats are unreserved so pre-booking is neither necessary nor possible. The same goes for all Colombo Commuter trains including the Puttalam & Avissawella lines. 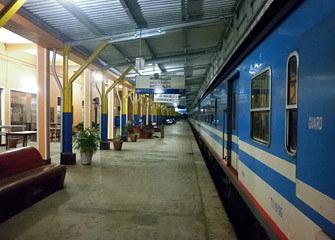 Tip: Many trains to Galle & Matara start at Colombo Maradana station before calling at the main Colombo Fort station. 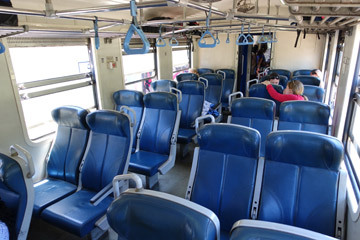 Rather than board at Colombo Fort when most of the seats will already be taken, if you board at Colombo Maradana you stand a good chance of getting a good seat on the coastal (right hand) side of the train. Many important longer-distance trains have a designated 2nd class reserved car and sometimes a 3rd class reserved car, in addition to the many unreserved cars. Some trains have a 1st class car and 1st class seats are always reserved. Seats in these reserved cars can be booked up to 30 days in advance - increased from 10 to 45 days in 2013, then reduced to 30 in 2016. If you buy a ticket for a reserved car you are guaranteed a seat, and a specific seat number will be printed on your ticket. The reserved cars are jealously guarded by an attendant, indeed he may lock off some exterior & gangway doors to control access, and there are no standees allowed - so reserved cars aren't crowded. The Railway Tourist Information Office at the front of the station sells expensive tours, but not train tickets, so don't bother with this. 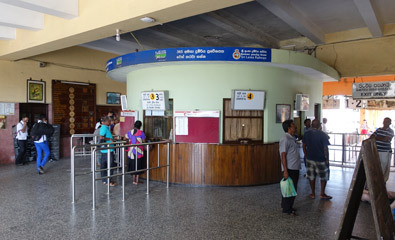 At Kandy station, you make reservations at ticket office counters 1 & 2, marked as the Intercity counter. Tickets for the reserved cars often sell out soon after booking opens, so it's a good idea to book tickets in advance before you get to Sri Lanka as explained in the next section. 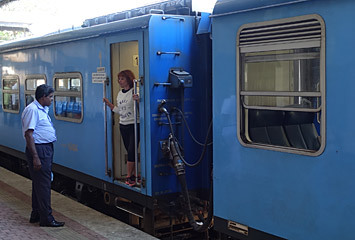 The 1st class observation car & air-con 1st class car on the blue trains from Colombo to Kandy & Badulla often get fully-booked well in advance and so do 1st class berths on all the Night Mail trains. 2nd class reserved cars often get full on the Hill Country trains, too. If you are told that a train is full, all this means is that the reserved seats have sold out. You can still buy a ticket at the station on the day for the 2nd & 3rd class unreserved cars, these cannot sell out. So you can still travel on that train, just without a reserved seat. 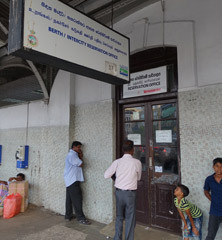 Sri Lankan Railways don't offer online booking, so to buy tickets for a reserved car before you get to Sri Lanka you'll need to use an agency. Option 1, buy online at 12go.asia. You can order Sri Lanka train tickets from 12go.asia, a reliable agency specialising in rail & bus booking throughout Southeast Asia and already popular for train bookings Thailand and Vietnam. You must order tickets more than 32 days before travel - this allows 12go.asia to process your order and buy the tickets for you as soon as Sri Lanka Railways opens booking, which gives you the best chance of getting the date, train & class that you want. Even so, tickets are in high demand, so I recommend selecting the Flexible option when you book, so that if your first choice of train or class is unavailable, they'll get you the next best class or next best departure on the same day. You collect tickets from an office in Colombo or for a small extra fee tickets can be delivered to your hotel. Note that 12go.asia have programmed their site with all the most popular station to station journeys including Colombo to or from the main tourist destinations of Kandy, Nanuoya & Ella, but not every possible station to station pair. Also remember that only reserved seat tickets can be ordered, unreserved tickets must be bought at the station on the day. Feedback would be appreciated if you use them. Option 2, VisitSriLankaTours. 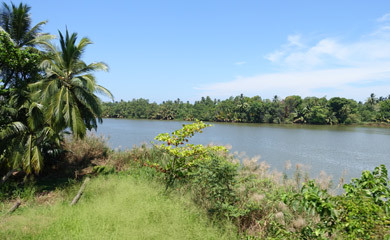 Another recommended agency is visitsrilankatours.co.uk/train-tickets-1.html. I have had numerous positive reports from people who have used them, and I have used them myself. 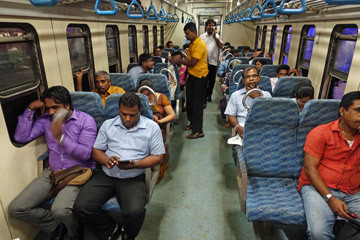 On some popular routes - for example Colombo to Kandy or Colombo to Tea Country - they sometimes book your tickets through the Mobitel system which allows Sri Lankans to pre-book trains if they have a Mobitel mobile phone. If so, all you have to do is collect your tickets from any Mobitel counter by showing the reference email and each traveller's passport. 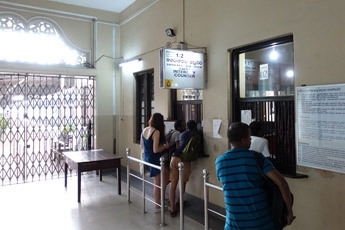 There's a Mobitel counter in the Colombo Bandaranaike airport arrivals hall open 24 hours - it was simplicity itself to collect all my VisitSriLankaTours train tickets there on arrival at 5am, and there wasn't even a queue. They may or may not use this system for your tickets, they may arrange ticket collection at the station ticket office which is also pretty straightforward. Option 3, Tourmastertravelservices. Another agency with an easy-to-use website with a page for ordering train tickets is tourmastertravelservices.com. I have had at least two very positive reports about Tourmatser so far, more feedback would be appreciated. The privately-run ExpoRail & Rajadhani carriages Colombo-Kandy/Hatton-Nanuoya-Elle-Badulla & Colombo-Galle-Matara can be booked online at www.exporail.lk & www.rajadhani.lk. But currently, Exporail have ceased operation and their website is down. Rajadhani's website says they are temporarily suspended too. Remember these agencies only make bookings for the 'reserved' cars. Even if you're told the train is 'fully booked' , you can always buy a ticket on the day and travel 'unreserved', see the explanation above. Opened in 1917, Colombo Fort is Colombo's main station, right in the heart of the historic Fort area, walking distance from all the sights. All mainline & commuter trains go from here. 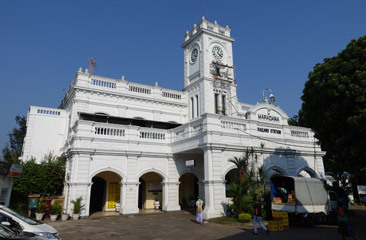 Colombo has a second main station one stop (2 km) to the east called Maradana, most but not all trains stop here, but Colombo Fort is the best-located station to use. 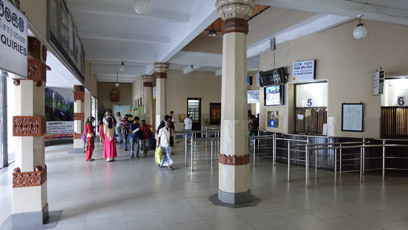 Ticket counters... To buy tickets for unreserved cars, go to the relevant counter on the day of departure. 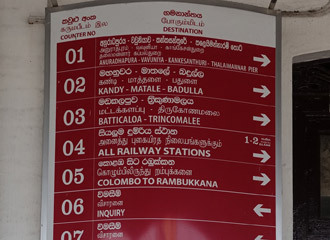 A board shows which counter sells tickets for which route. The counters are all accessed directly from the roadway in front of the station. Berth/intercity reservations office... To buy tickets for reserved seats cars, sleeping-cars or sleeperetts, go to the reservations office, labelled as counter 17 & accessed from the roadway in front of the station towards the left hand end of the station facade. Inside the office there are different counters for different routes. Allegedly open 06:00-14:00 but possibly until 17:00, closed for lunch 12:30-13:00. Inside Colombo Fort station... That's the station building on the left of this photo. From the front of the station, you walk through one of several passageways past a ticket barrier onto platform 3, which is the platform visible on the left of this photo. The train on the right is on platform 4. The central footbridge - from which this photo was taken - connects mainline platforms 3-6. The eastern and western footbridges connect platforms, 3-10. Platforms 1 & 2 are bay platforms located at the east end of platform 3, top left of this photo. The electronic departures & arrivals board is just out of shot on the extreme left of the photo. Sri Lankan Railways don't excel at customer information, they don't have platform departure indicators nor do the trains themselves carry any destination boards. So always check which platform your train leaves from as you enter the station. 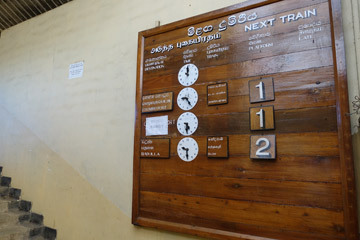 At Colombo Fort there's one main electronic departures & arrivals board, pictured below left, it's very easy to miss as it's directly above and behind your head when you walk onto platform 3 through the main ticket barrier next to ticket counters 7, 8 & 9. This will tell you which platform to go to, but remember if you're going to Galle your train may be shown as going to its final destination, Matara, and if you're going to Hatton, Nanuoya, Haputale or Elle your train will probably be shown as going to Badulla. At most other stations there's a more low-tech solution to tell you the platform to go to, like the board at Nanuoya station below right. 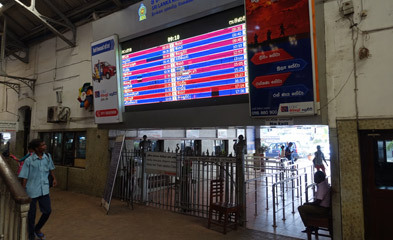 Departures board at Colombo Fort. You simply take your luggage with you onto the train and put it on the overhead racks above your seat. 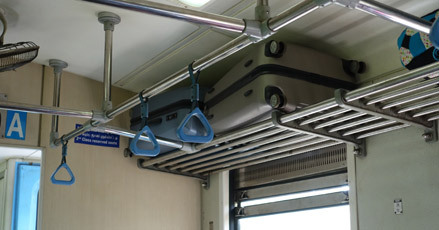 The overhead racks will take anything up to a large backpack or hefty roll-along size. A huge suitcase - if you insisted on travelling around Sri Lanka with such a thing - would just go on the floor. Luggage isn't usually an issue, nobody weighs it or worries about what you take. A handful of trains including the Chinese-built blue trains and most Night Mails have a small buffet counter with limited stock - crisps, fizzy drinks, and hot sweet tea. However, if you are in a reserved car the gangway doors to the rest of the train may be locked, so don't assume you'll be able to get to the buffet. It's best to bring your own food & drink. It's hot and humid in Sri Lanka, so always travel with plenty of bottled water. You may find vendors wandering down the train, but don't rely on this - though if you see the tea wallah, flag him down for a cup of lovely hot sweet tea, 40 rupees (20p) or so per cup. Luggage on overhead racks on a blue train. 3rd class seats: 3+2 across car width. 2nd class seats: 2+2 across car width. A 1st class observation car is attached to the rear of train 1007/1008 on the amazingly scenic route from Colombo to Hatton, Nanuoya, Elle, Haputale & Badulla, and to several other trains on that route, see the timetable here. 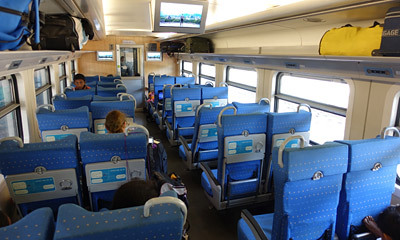 It has comfortable (if old) reserved seats facing large rear windows looking back along the track. It's very popular & usually gets fully-booked, so book ahead. Some of these observation cars are not air-conditioned so the side windows open, ideal for viewing & photography. However, some cars now have air-conditioning, yours may or may not have. Don't expect any catering, so bring your own food & drink. Luggage goes on overhead racks above your seat, or on the floor. The Man in Seat 61 says "If you can get tickets for it, the 1st class observation car is the best way to experience and photograph the journey from Colombo up into Tea Country. The excellent view back along the track gives an unrivalled picture of how this wonderful railway is constructed, often hugging the hillside with overhanging rocks..."
Introduced in 2012, these modern Chinese-built class S12 trains operate the daily Podi Menike and Udatara Menike trains between Colombo, Kandy, Tea Country and Badulla, see the timetable here. There's a power car and driving cab at each end of the train, between which there's one 1st class air-conditioned reserved seats car, one 2nd class reserved car, two 2nd class unreserved cars, three 3rd class unreserved cars (one with a small buffet counter) and one 3rd class reserved car. 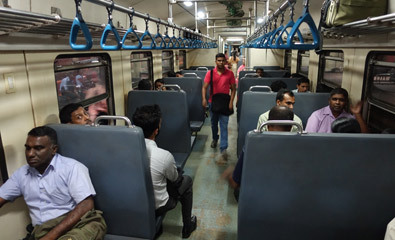 2nd & 3rd class cars are not air-conditioned and come with large opening windows. 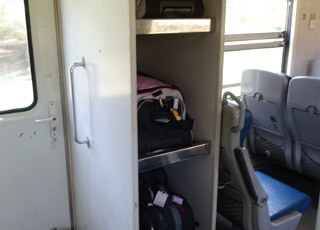 Luggage up to back-pack sized fits on the overhead racks, or in the 2nd class cars there's also a floor to ceiling luggage rack for larger items. 3rd class: 3 unreserved cars, 1 reserved car. 2nd class: 2 unreserved cars, 1 reserved car. 1st & 2nd class cars. Note the smaller windows in 1st! 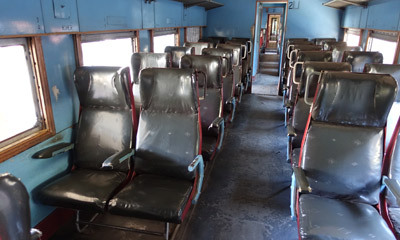 The Man in Seat 61 says: "These blue trains are way ahead of other Sri Lankan trains in comfort - although if you can get a seat in it, a 1st class observation car on a classic train would still be my first choice for a journey into the hills. But a seat in the 2nd class reserved car on a blue train would be my next choice." 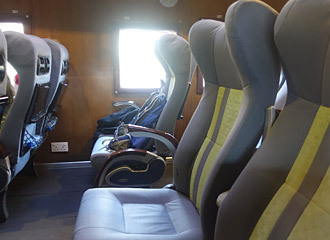 Tip 1: The air-conditioned first class car (AFC) is almost up to western standards, with fabric reclining seats, seat-back tables & ceiling-hung video screens, fortunately with no sound. So if you absolutely insist on air-conditioned western-style comfort, this is the way to go. But before you make a knee-jerk decision to go first class, think it through. In the AFC car you are sealed in behind small and slightly grubby windows and you won't experience the journey fully. You can't take decent scenery photos unless you nip to one of the inward-opening entrance doors. You will experience the scenery far better in 2nd class reserved seats with their large open windows. Tip 2: The second class reserved car (SCR) is great option, with comfy seats, armrests & drop-down seatback tables, and a breeze wafting in through open windows. If you find the SCR car fully-booked, a seat in the 3rd class reserved car (TCR) is a good alternative, so don't knock it - you are better off with a guaranteed seat in the uncrowded 3rd class reserved car with no standees allowed than without a seat in a full-and-standing 2nd class unreserved car. Tip 3: Avoid waiting at the wrong end of the platform, especially at an intermediate station such as Nanuoya or Elle! 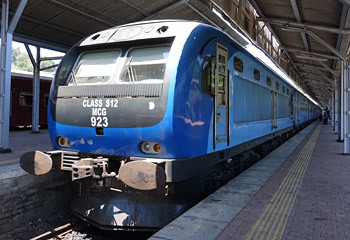 The AFC & SCR cars on these trains are usually at the Colombo (West) end of the train between Colombo and Kandy, and at the Badulla (East) end of the train between Kandy & Badulla - these trains have a driving cab at both ends and change direction at Kandy, which is a terminus. So at Colombo Fort when you walk off the forecourt onto the platform, look to your right and the AFC & SCR cars will be towards that end of the platform. 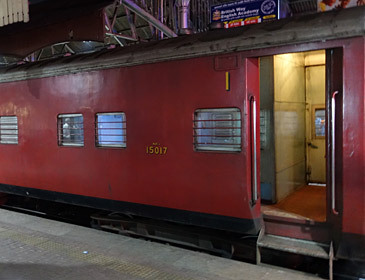 When you board at Kandy, the AFC & SCR cars will usually be furthest from the buffer stops. Tip 4: You usually board the AFC or SCR cars through the AFC doorway next to the SCR - the attendant may have locked other exterior doors to control access to the reserved cars. Similarly, the internal gangway door between the the AFC/SCR cars and the rest of the train will probably be locked, so don't expect to visit the buffet. Bring your own food & drink, although the tea wallah has been known to make it into the 2nd reserved car - that hot sweet tea is lovely, do try it! 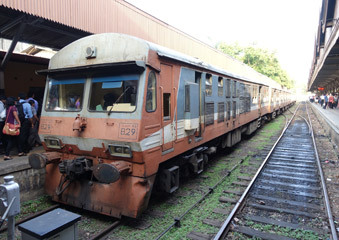 Introduced in 2011, these trains operate key departures on the Colombo-Galle-Matara route - other departures are classic trains. They have 2nd & 3rd class unreserved seats, with a power car at one end and a driving cab at both ends. 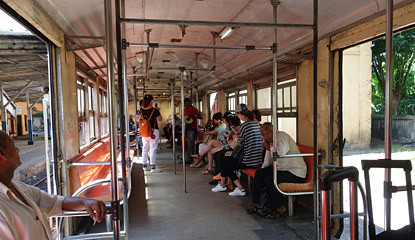 Like most Sri Lankan trains, the doors normally remain wide open while the train is moving. 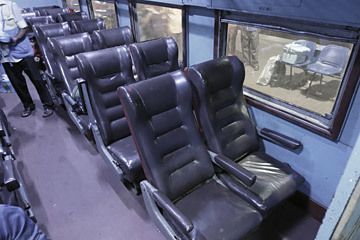 The 2nd class seats are comfortable and have drop down tables and armrests. Sri Lankan Railways has some newer Chinese-built cars like this, which you'll usually find on the northern routes, for example certain trains from Colombo to Jaffna, Talaimannar & Batticaloa. A big improvement on the classic trains. A 1st class sleeping-car is attached to a handful of Night Mail trains. The cars have lockable 2-berth compartments with separate toilet & washbasin. The cars are old, fairly basic and a tad grubby, so manage expectations accordingly, but they are comfortable enough with clean bedding provided. There's only one sleeping-car per train, they are very popular and usually get fully-booked soon after bookings open. So book ahead, and have a plan B if you can't get a sleeper. Pictured below is the distinctly-Indian design of sleeper on the Night Mail from Colombo to Badulla. Sleeperetts are reserved seats which recline to about 30-40 degrees. 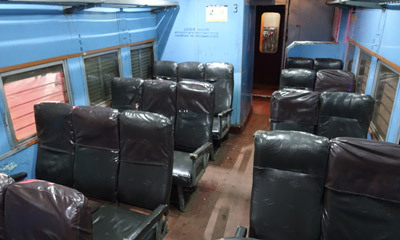 Night Mail trains typically have one 2nd class reserved sleeperett car, one 3rd class reserved sleeperett car, and several unreserved 2nd & 3rd class regular seats cars. A couple of trains a day on the route from Colombo to Kandy & Tea Country carry a privately-run 1st class air-conditioned ExpoRail car with special fares, WiFi, power sockets & inclusive meals, see www.exporail.lk and the timetable here. The Exporail carriages on the Colombo-Kandy & Colombo-Nanu Oya-Badulla routes normally have a small open-air viewing platform at one end, ideal for photography. Update: The Exporail car is no longer running - Exporail have ceased operation. The Man in Seat 61 says, "The Exporail car is very comfy, easy to book online and popular with tourists. 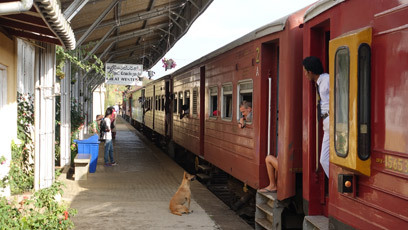 The open air viewing platform makes it a great option on the Tea Country route - but bear in mind that they often allocate a somewhat tatty older car without a viewing platform, in which case you'll be sealed in and would be far better off in a regular Sri Lanka Railways car with opening windows." 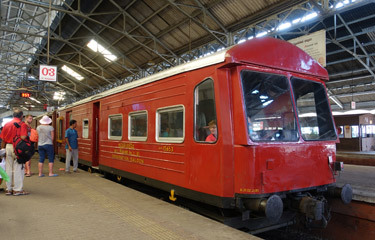 A privately-run air-conditioned 1st class car is attached to one Colombo-Kandy train, one Colombo-Tea Country train (timetable here) and one Colombo-Galle-Matara train (timetable here). It has leather seats & free WiFi, see www.rajadhani.lk. The Rajadhani carriage is cancelled at the moment due to contractual issues, check their website for any updates. It's now been cancelled for some time. The Man in Seat 61 says, "The Rajadhani car dates from 1970, so externally it's older and grubbier than their website suggests. But it's easy to book online, it's very comfy, well air-conditioned, has effective WiFi - if you correctly enter the world's longest WiFi password, that is - and is very popular with tourists. On the downside you are sealed in behind small and very grubby windows, making it a poor way to experience the journey. Taking photographs of the scenery is almost impossible, so you are better off in regular 2nd class. I also got absolutely no food or drink service when I used Rajadhani on the Galle route. I'd say Exporail is a cut above Rajadhani, although they are broadly similar concepts"
The wonderful train ride to Tea Country. See the journey in pictures & watch the video! The train ride from Colombo to Kandy and up into the tea plantations of Sri Lanka's hill country is truly wonderful, not just transportation but a classic journey that's easily the best train ride in Sri Lanka. I recommend a reserved seat in the 1st class observation car if you can get one, failing that a seat in the 2nd or 3rd class reserved cars on one of the excellent new Chinese-built blue trains. See the journey from Colombo to Nuwara Eliya in pictures & watch the video! Sleeper = NIGHT MAIL with 1st class sleepers (2-berth compartments), 2nd & 3rd class reserved sleeperetts (reclining seats), 2nd & 3rd unreserved seats. Always check train times for your date of travel as shown here, and check all times locally. Peradeniya Junction is 6 km (3½ miles) from Kandy. Take a tuk-tuk or bus here to board trains for Hatton, Nanuoya, Elle & Badulla if they don't call at Kandy. Several trains a day link Kandy & Matale, check times as shown here. 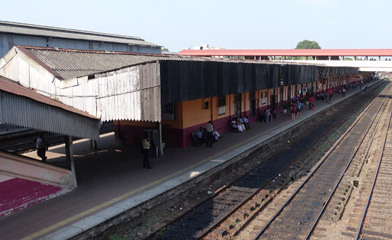 Kandy is essentially a terminus, but platform 1 is a through platform used by Matale trains. 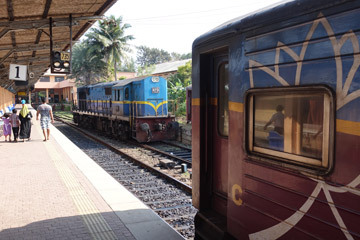 Children under 12 pay half fare with Sri Lanka Railways, children under 3 travel free. Sleeperetts on the Night Mail train costs the same as a reserved seat. Nuwara Eliya (the City of lights) is a colonial hill station 2,000 metres above sea level, surrounded by tea plantations It's easy to reach, just take a train to Nanuoya station, 6 km from central Nuwara Eliya. You'll find plenty of taxis and tuk tuks available at the station. The journey: See a train ride from Colombo to Nuwara Eliya in pictures & watch the video! 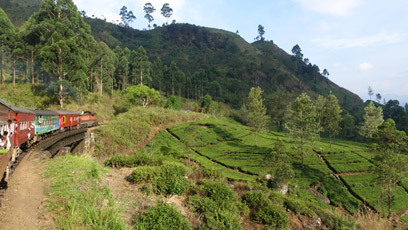 Train 1007 from Colombo to Badulla heads through the tea plantations between Hatton & Nanuoya. Kandy Lake, across the road from the excellent old Queen's Hotel. Traveller Antony Smith reports "All the windows in the 1st observation car opened fully so, though it was a baking hot day, the carriage was wonderfully breezy and naturally cooled. And yes there are only two pairs of seats with uninterrupted views through the rear observation window, but to be honest the best views are to the sides anyway rather than back down the track. And there's a great child-like pleasure to be had from sticking your head out of an open side window, which you can't do in the seats directly in front of the rear observation window. 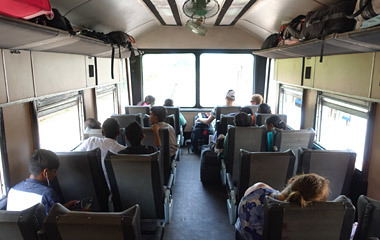 I do agree about not wanting to be locked into a 'tour bus' environment with only other tourists for company, but passengers in the 1st observation car on the day we travelled were a real mix of Westerners and Sri Lankans. We took a peek at the ExpoRail 'luxury' carriage (which now also does the train we were on, the 05.55 Podi Menike from Colombo). It is undoubtedly comfortable, though not luxurious in my opinion, and has the advantage of online booking and on-board catering. But it lacked the old-fashioned charm of the 1st observation car and looked to be a 100% tourist only experience, mostly tour groups." Traveller Graeme Thorley reports "I thought the observation car to Kandy was okay although it requires you to travel backwards (in my case at least) which is not to everyone's taste. It also got incredibly hot (36°C at one point) due to the large window and there were only a limited number of seats that had a really good view. Rather irritatingly on my outbound trip two of these were occupied by people who slept for most of the trip..! The other point is that the carriage was occupied almost entirely by Westerners - this might be considered a good thing but personally I felt it left me more remote from the travelling experience. On the train to Anuradhapura several locals stopped to chat, practise their English, exchange complaints about the delays etc. I also bumped into one of the families I had met on the train whilst sightseeing (they recognised me) and we had another chat. I find that sort of thing an important part of travelling." 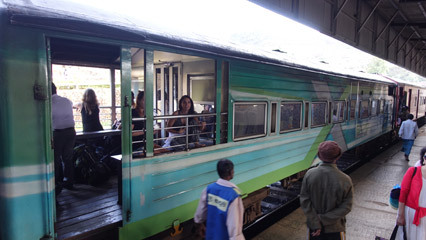 Traveller Paul White reports "Don’t panic if you can’t get a ticket for the 1st class air conditioned trains to Kandy. 2nd class is more than adequate, but do try & get a window seat. The best side to sit on for scenery is the right hand side as you face forward from Colombo to Kandy, as this will give you the best views once you get past Rambukkana. Do be brave and try the food on the trains! Many vendors will wander up and down selling cold drinks, fruit, spicy snacks and so on at reasonable prices." 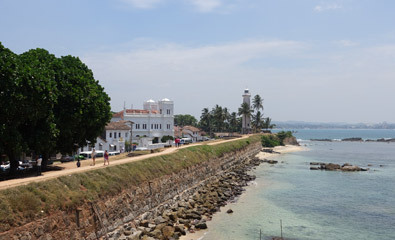 Galle - pronounced Gawl in English or Gaar-ler by the locals, is a real gem and the fort area with its Dutch colonial buildings should not be missed. Plan to stay there if you can - see some suggested hotels here - but if you can't then at least do a day trip to Galle from Colombo. The best way to get to Galle is by train, using the coastal railway which runs all along the coast from Colombo, past the Indian Ocean surf, palms and beaches. A treat! Sri Lanka Railways regularly tweaks its timetables, so check current times as shown here. 1 = all-reserved 1st class observation car, air-conditioned, runs on train 8050 & 8051. Can be booked at 12go.asia with at least 32 days notice. 2 = unreserved 2nd class seats, some departures classic & some S11. 3 = unreserved 3rd class seats, some departures classic & some S11. 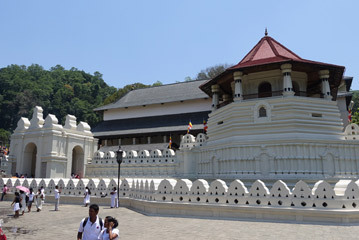 The once-daily through service Kandy-Galle-Matara is also shown above. Most trains on this route are classic trains, but several afternoon departures from Colombo & several morning departures from Matara & Galle are S11 diesel units. Many additional Colombo Commuter trains link Colombo with Mount Lavinia & Kalutara South, these aren't shown here. Always check train times for your date of travel as shown here, and double-check train times locally. Children under 12 pay half fare, children under 3 travel free. 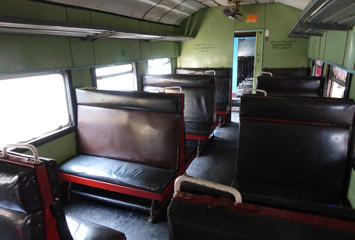 One train per day on the Colombo-Galle-Matara route has an all-reserved 1st class observation car which needs to be booked in advance, but all other trains just have 2nd & 3rd class unreserved seats with tickets sold on the day of travel, no reserved seats and no 1st class. Just turn up, buy a ticket at the ticket office and hop on. Tickets cannot sell out! 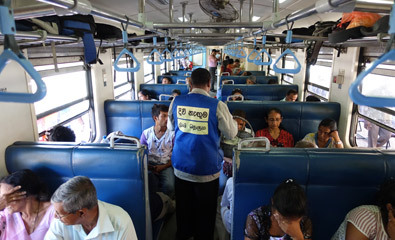 Tip: Rather than board at Colombo Fort when most of the seats may already be taken, if you board at Colombo Maradana you stand a good chance of getting a seat, even a good seat on the coastal (right hand) side of the train. Colombo Maradana station. Most trains to Galle & Matara start here before calling at the main Colombo Fort station. If you board here as soon as the train is platformed you can usually get a seat, ideally a window seat on the right hand side for the ocean views. 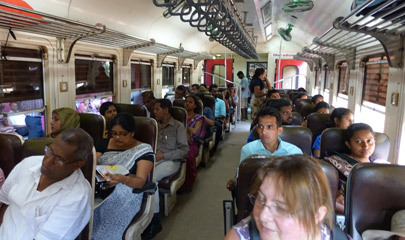 If you board at Colombo Fort, most seats may already be taken when the train rolls in. Galle railway station. Galle is a terminus, Colombo to Matara trains change direction here. Locomotive running round its train at Galle. 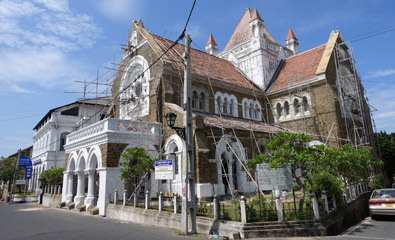 The distinctly British All Saints church of 1871, Galle. 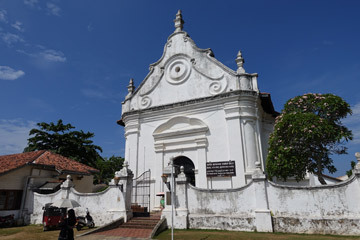 The famous Dutch Reformed Church of 1755, Galle. Walking the walls of Galle Fort. 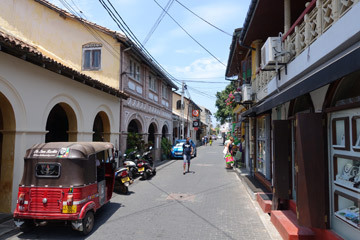 Street in Galle's delightful fort area. 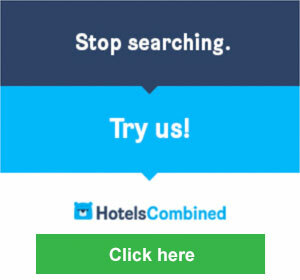 Suggested hotels. The southern tip of Galle - Flag Rock. (06:05) = Depart Colombo 06:05, arrive Galoya 11:36, change trains, depart Galoya 12:00 for Trincomalee. (15:15) = Arrive Colombo at 15:15, having changed at Galoya Junction from local train into the express. Train 6011 uses the newer type of 2nd & 3rd class seats. Sleeper = NIGHT MAIL with 1st class sleepers (2-berth compartments), 2nd & 3rd class reserved sleeperetts (reclining seats), 2nd & 3rd unreserved seats, buffet car. Always check train times for your date of travel as shown here & double-check all train times locally. Children under 12 pay half fare, children under 3 travel free. * = Reclining sleeperett seats. Habarana & elephants: Habarana station is a tiny single-platform station 3.5 km from Habarana town, but there are tuk tuks available. In Habarana town you can hire a jeep and driver to take you around the Habarana Huluru Eco Park to see elephants in the wild, a fabulous experience. For a different sort of elephant experience I highly recommend a short stay at the Elephant Freedom Project, located a short tuk tuk ride from Rambukkana station where all Colombo-Kandy trains stop. It's close to the well-known Pinnawala Elephant Orphanage, but you should read up on concerns about Pinnawala before visiting. The morning train to Colombo at Batticaloa. 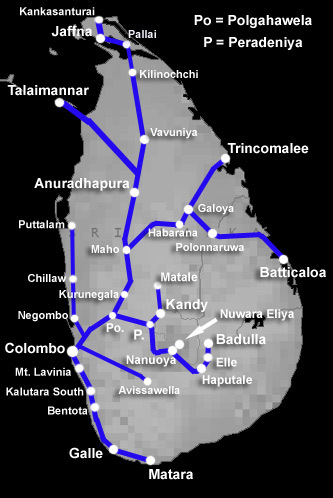 Trains link Colombo with Anuradhapura, Vavuniya & now Talaimannar & Jaffna. 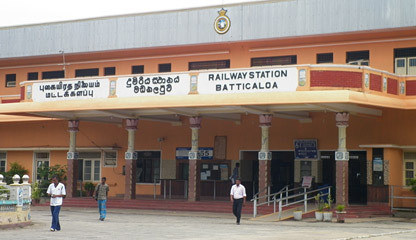 In 1990 trains stopped operating to Jaffna or Talaimannar Pier (previously the ferry terminal for India) because of longstanding security problems, but in September 2013 trains were reinstated as far as Kilinochchi, from early 2014 as far as Pallai and finally the line to Jaffna reopened in mid-October 2014. The trains to Jaffna now continue as far as Kankesanthurai. Trains were restored to Talaimannar town & Talaimannar Pier in April 2015, although there's no ferry to or from India. 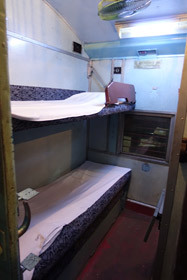 Sleeper = NIGHT MAIL, 1st class air-con seats car, 2nd & 3rd class reserved sleeperetts, 2nd & 3rd unreserved seats, buffet. This train has no 1st class berths. O = 1st class observation car with reserved seats of the newer type. 1 = 1st class car with reserved seats, usually the newer type, but train 4021/4022 is an all-air-con-1st class version of an S12 blue train. 2 = 2nd class seats, reserved & unreserved, usually the newer type. 3 = 3rd class seats, unreserved, usually the newer type. Children under 12 pay half fare, children under 3 travel free. Reclining sleeperetts on the Night Mail train cost the same as a reserved seat. Anuradhapura station... Photo courtesy of Chris Rowland. 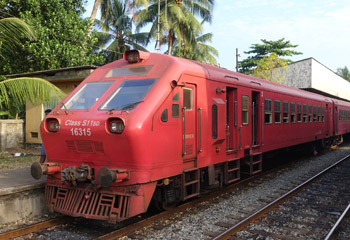 Colombo Commuter trains link Colombo with various stations in the Colombo area, including Mount Laviniya (for the famous Mount Laviniya Hotel), Negombo, Puttalam, Kalutara North & Kalutara South where there are many popular resort hotels. Although basic, these commuter trains are ideal for reaching your hotel cheaply, or making day trips into Colombo during your stay. As you'd expect, they get crowded at peak travel-to-work times but they are perfectly bearable outside the peaks. Colombo Commuter trains are 3rd class only. Fares are incredibly cheap: Colombo to Kalutara South or Negombo costs 40 rupees, about 20p. Buy a ticket at the ticket office & hop on. Note that Colombo-Galle mainline trains also call at Mount Laviniya & Kalutara South (but not Kalutara North). Colombo-Kandy mainline trains also call at Rambukkana. The famous & luxurious 4-star Galle Face Hotel in Colombo is fantastic, a firm favourite of mine, but price-wise it's a real steal by western standards. 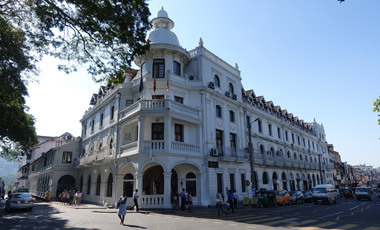 Fully modernised, but still brimming with old colonial charm, it's just south of Colombo city centre, a 5 minute tuk-tuk ride from Colombo Fort station or you can walk into town in 20 minutes along the Galle Face Green promenade. Many famous guests have stayed here, from Alec Guinness and Duke Ellington to Harrison Ford and Carrie Fisher. You'll photos of celebrity guests in the hotel museum on the 2nd floor, along with HRH Price Philip's first car, bought in Ceylon in 1940 for £12. The hotel features an excellent outdoor swimming pool with lido alongside the Indian Ocean, a spa, and very affordable breakfast, lunch and dinner buffets served on the veranda under whirring ceiling fans. Rooms have free WiFi, tea & coffee facilities, valuables safe, air-con. 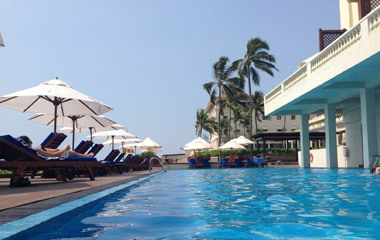 The best place to stay in Colombo, close enough to visit the city centre yet you feel like you're staying in a resort. Check prices & book. 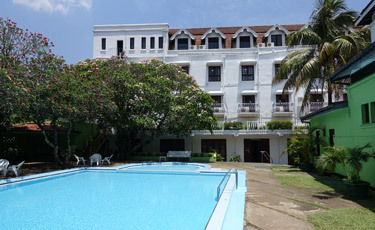 Also worth mentioning as it's another famous classic luxury hotel, this time a short commuter train ride south of Colombo, is the Mount Laviniya Hotel. 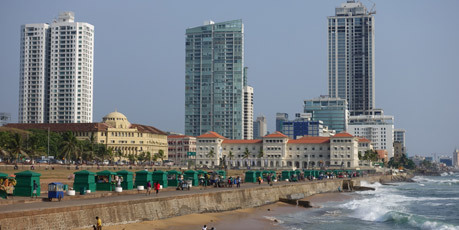 The historic Galle Face Hotel nestles below the high-rise blocks at the southern end of Galle Face Green. 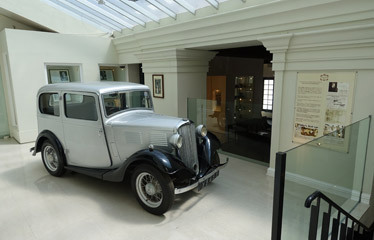 HRH Prince Philip's first car, in the hotel museum. 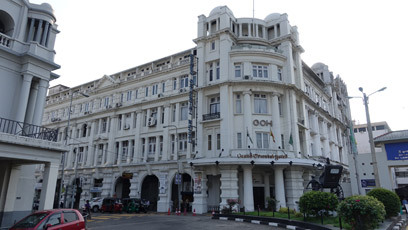 If you're on a budget but still want a classic historic place to stay, Colombo's other famous old colonial hotel is the Grand Oriental Hotel, known locally as the G.O.H. In former times, when you stepped off the steamer from Blighty and walked out of the Port Authority Building, the P&O Building would be across the road on one side of York Street, the venerable G.O.H. on the other. The G.O.H. hasn't had the upmarket western-style makeover like the Galle Face, so it's less than half the price - faded grandeur on a budget. 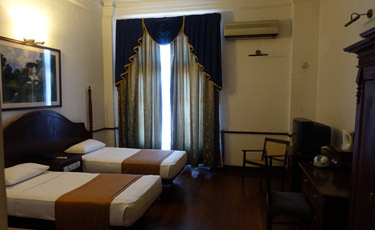 But it's very comfortable and perfectly located amongst the old colonial buildings of the Fort area, 15 minutes walk from Colombo Fort Station. Cheap breakfast, lunch and dinner buffets are served in the restaurant on the 4th floor with great views over Colombo harbour. There's a valuables safe in your room, air-con, room service, tea & coffee facilities and free WiFi. 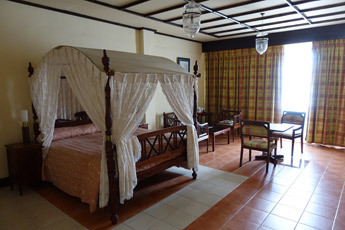 The deluxe rooms even feature a four-poster bed. Check prices & book. 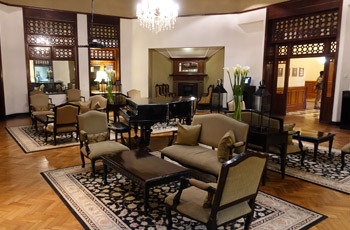 Sticking with the faded colonial grandeur theme, the inexpensive Queen's Hotel in Kandy also has a long and venerable history. 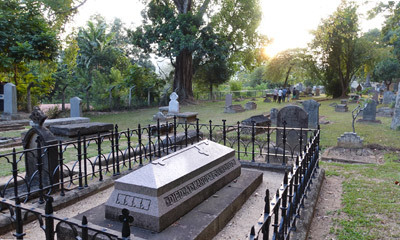 Built as a residence for the Governor of Ceylon and a barracks for the Ceylon Rifle Regiment, famous guests include Lord Mountbatten of Burma who stayed regularly when Supreme Allied Commander South East Asia. The hotel is perfectly located across the road from both Kandy Lake and Kandy's top attraction, the Temple of the Tooth, and just a 15-minute walk or 5-minute tuk-tuk ride from Kandy station. Like the G.O.H. it hasn't had the upmarket western-style makeover, so it's relatively inexpensive, just don't expect the red carpet up the stairs to be spotless. It's a favourite with independent travellers and best of all has an open-air swimming pool and lido adjacent to the wood-panelled bar in the centre of the buildings, an oasis in the heart of the city. 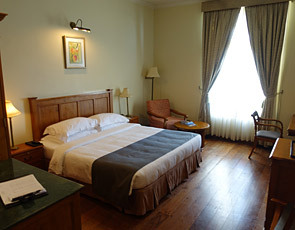 Rooms have high ceilings, tile or teak floors, ceiling fans, air-con, tea & coffee facilities, safes, and free WiFi. Check prices & book. 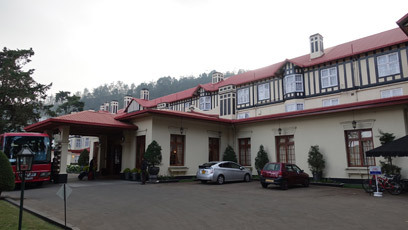 Still amongst the best hotels in the hill station of Nuwara Eliya, the venerable Grand Hotel is both classy and historic, you can read about its history at https://en.wikipedia.org/wiki/Grand_Hotel_(Nuwara_Eliya). Even if you don't stay here, at least have a drink in the bar... Check prices & book. There are a whole host of boutique hotels and guesthouses in the old historic Galle Fort area, which is where you'll want to stay. Top of the heap is the absolutely wonderful but silly-money (even by western standards, at £500+) Amangalla Hotel, perfectly located a few yards from the Dutch Reformed Church. Formerly the New Oriental Hotel, it has a long 140+ year history. At least have a cup of tea on the veranda! 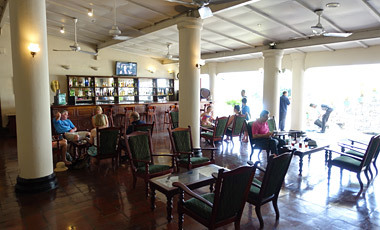 Also excellent, upmarket and not cheap, but half the price of the Amangalla is the nearby Galle Fort Hotel. For something much more affordable, potentially under £100, but still deluxe, boutique and perfectly located in the historic fort area, try Fortaleza or the Fort Printers. On a tight budget, try the Antic Guesthouse, at under £50. Allow for taxes when booking Sri Lankan hotels.. When booking Sri Lankan hotels, note that Sri Lankan national & city taxes often aren't included in the price you see, unlike prices shown for hotels in Europe. This can add 25%-30% to the price you see. After many years of being cut off from each other, a new ferry service started between Colombo in Sri Lanka and Tuticorin in India in June 2011, website www.flemingoliners.com. The modern cruise ferry 'Scotia Prince' started sailing twice a week in each direction, leaving at 18:00 and arriving at 08:00 next morning, although sailing days changed from week to week. 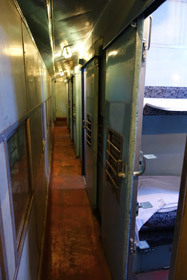 All passengers got a sleeping berth in a cabin, fares ranged from 2,243 Indian rupees (about £47 or $77) in an economy class single-berth cabin to 2,760 Indian rupees (£58 or $95) in a super deluxe single-berth cabin, all fares included a non-alcoholic 'welcome aboard' drink and a fixed-menu dinner. They had aspirations to make it a daily service in due course. However, due to a dispute over money owed to the caterers(! ), the ferry was impounded in December 2011, and isn't currently running. The operator isn't sure when (or if) it will resume. A second ferry service, between Rameswaram and Talaimannar was rumoured to be starting by the end of 2011, but again no details are available and nothing seems to have happened. So currently no ferries at all link India with Sri Lanka. Sri Lankan airlines fly direct from the UK to Colombo, and are very good. Even in the age of the internet, it makes sense to invest in a guidebook, both for planning and carrying when you're there. Don't expect the internet to tell you everything, especially when on the move with sky-high mobile data costs! For independent travellers, I consider the best guides are the Rough Guides or Lonely Planets.